The previous four classes I’ve described are all derivative of tried-and-true playstyles from other games. Mercy is a Medic, Junkrat is a grenadier, Widowmaker is a sniper, and Soldier 76 is every rifleman ever. But while he’s not nearly as easy to pin down, Lúcio quickly became one of my favorite classes to play because I can’t think of a single shooter with somebody like him. He feels like a support unit out of a real-time strategy, to be perfectly honest. With his boombox loudspeaker thing, he can either passively heal all the teammates around him (including himself, completely subverting No Self Heal) or give everyone a speedboost. Pressing E further boosts his healing/mobility effect for 3 seconds, meaning that he’s a support character who barely has to pay attention to his own abilities, and this makes him incredibly fun to play. 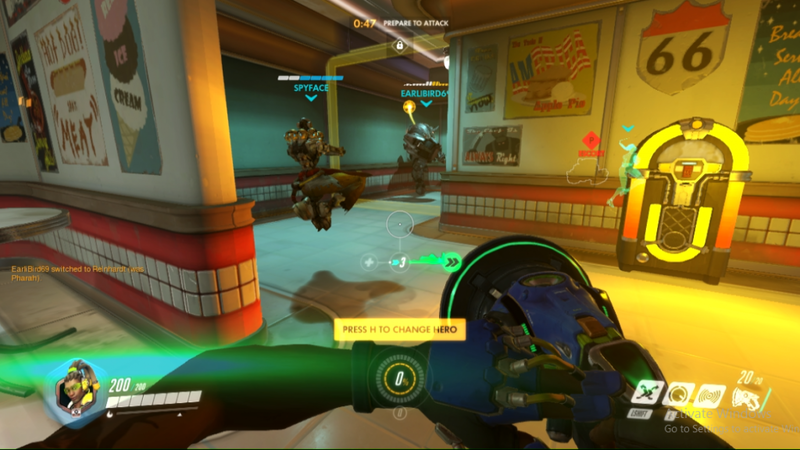 Lúcio, to nobody’s surprise, is strongest when surrounded by his teammates. On the front lines his most useful strategy is to keep out of the enemy’s sight through his mobility and through the respectable damage he can churn out with his boombox thing. The sonic projectiles have no damage falloff, meaning he has no motivation to bridge the distance between him and the enemy. And if they do get too close, the alt-fire sends them flying backwards, making environmental kills and daring escapes more possible. His walljump is another unique mechanic and the one I’ve taken the longest to get the hang of. While in the air and touching a wall, you can hold space bar to kinda surf along the wall, which doesn’t seem to speed you up but allows you some mobility options. At lower skill levels, you can use it to mix up your location and gain a legup in combat, and as you improve you can become absolutely insane at hiding in the rafters while you heal everyone. Walljump is also apparently quite good at escaping pitfalls. If I can get the hang of it, I’m sure I can become a truly self-sufficient healer, speeding around the map in three-dimensions while still keeping everyone’s health up and dealing respectable damage to boot. I was quite excited when I found Lúcio, because he was the first class that I’m going to truly miss when Overwatch returns to the veil of closed beta. While I can play plenty of other games and get the same feeling as Mercy, Soldier 76, Widowmaker or Junkrat, I don’t really know of a shooter with a character class like Lúcio, and it’s a fun one. If you’re looking at Overwatch, definitely try out Lúcio, but perhaps do some research first because he’s not very intuitive at a glance. Next Next post: Overwatch comes out today!